The market for home security cameras that connect to your smartphone is broadening on a seemingly daily basis. There are many options to choose from right now. I’ve even reviewed several models in this column, in recent months. Well here’s another, as I have been trying the new SpotCam ($160) for the past few weeks. Like other models, this one plugs into any wall outlet in your home. It has a generous cord length, giving you flexibility to move it around. Plus it comes with a little mounting kit that allows you to secure it to a wall if you’d like. Once you turn it on, it creates its own WiFi network. In the meantime, you download its app to your smartphone, get into the app and follow the easy instructions. Essentially you first pair your phone to the SpotCam WiFi network and it’s forever in communication with the camera from that point on. The whole thing took me less than five minutes. And like a lot of people, I winged it without really reading the instructions. From there, you just turn on the app whenever and wherever you want, and it instantly shows you what the camera is seeing. And yes, you can hook up multiple cameras, if you’d like. I was intrigued by several different features of this camera. For instance, it has wide angle viewing — something that was not available in the previous models I reviewed. And you can pan the camera in all directions. The panning can go fast or slow, and allows you to zoom in to focus on anything specific. Everything is very silent, so you can be conspicuous if you’re spying on people in your home. Not only can you listen to what’s going on in the room with the camera, but you can also talk back through the camera. The manufacturer officially refers to this as a “two-way audio” feature. So if you see your kids doing something you don’t want them to do, you can speak into the microphone in your phone and they can hear it wherever the cameras are. Or what if you see an intruder? You can speak to that person from a safe remote place and warn him or her that they’re being watched and the police are already on the way. SpotCam also has night vision viewing — thanks to 18 high-power infrared LED’s built into its face. Other models I’ve seen in the past did not offer this feature. And this one works outstanding. Case in point: My wife and I went away for a night — the first time we’ve ever left our teenagers alone by themselves. I wanted to make sure nothing too crazy was going on. So I discreetly checked in at about 11pm one night. I was able to see that indeed the kids had turned off all the lights and were probably asleep. It was just good peace of mind. One thing you should know up front: When the lighting is too dark and the infrareds take over, the view you see on your smartphone is in black-and-white. It’s otherwise full color. And always in high definition. 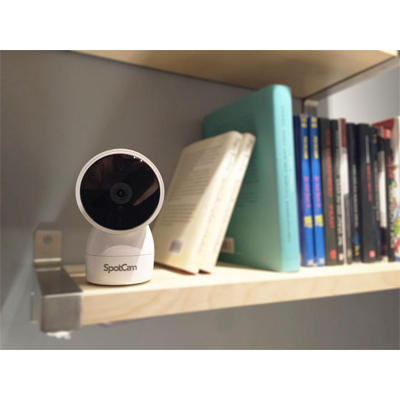 SpotCam also offers free secured video recording in the cloud. There are several levels available, and some cost extra. In fact, you can make a time-lapse video out of your recording footage in a matter of seconds. The manufacturer claims that all video streaming and storage are protected and transmitted with bank-level security. Overall, I found this to be a simple-to-use, straightforward camera that works as advertised.